Havaianas Brightens Up Summer 2016! ​Gear up for the warm summer weather with Havaianas Summer ’16 collection! With styles for everyone, Havaianas not only offers new designs/patterns of their world-famous flip-flops, but also a variety of sandals, espadrilles, and accessories. Each collection is as fashionable as it is functional while incorporating Havaianas’ signature fun, vibrant, Brazilian spirit of life into their designs. 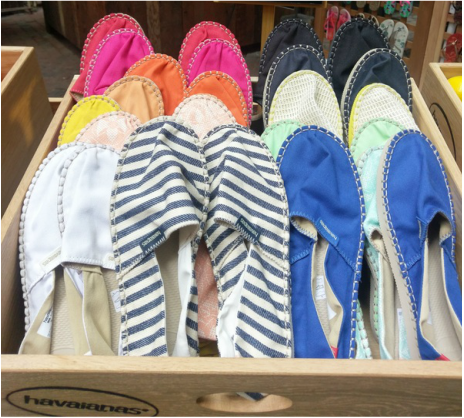 Havaianas just recently collaborated with Liberty London to create a capsule collection of flip-flops, espadrilles, beach bags and towels. Going back in Liberty London’s pattern archives, Havaianas was able to rework prints that originate from the 1960’s for this collection of colorful, floral-printed accessories. Other new styles include the “slim” style with vegan leather straps (a more sophisticated take on their classic “slim”), the Team USA Collection (great alongslide the classic “Brazil Logo” flip-flops in celebration of the Summer Olympics in Rio de Janerio), Disney princess flip-flops for both women and girls and superhero designs for boys. There are also new colors in their signature waterproof bags—perfect for taking to the beach or on any vacation!